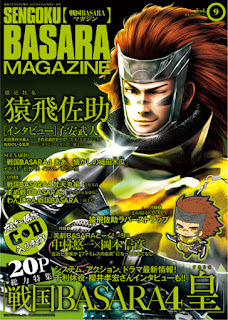 This week saw the release dates for both Sengoku Basara Magazine and Dengeki Maoh, so there's a little extra coverage on top of the expected Weekly Famitsu update in a few days. It's Monday so the official website updated with a new Sengoku Basara 4 Sumeragi video. It's a short gameplay clip; Kenshin shows off his new Shinran ('Divine Storm') and Shinkyoku ('Divine Thorns') specials. It will be a while before my copy arrives, but the cover has been updated on the magazine's official website to reveal a brand new Sasuke render. This tweet shows the title page for the new Sengoku Basara 4: Aa, Natsukashii No Oda Mokkou ('Ah, The Good Old Oda Mokkou') scenario novel I mentioned previously. It's good to see Nouhime and Ranmaru appearing again, and I guess this also confirms that the staff have no plans to make major changes to their designs if they return in future. According to the website, there are some production notes about designing Nobunaga to look forward to as well. The next issue will feature Kojuurou and what looks like a new scenario novel about Sen No Rikyuu. In addition to the Sengoku Basara Magazine goodies, Japanese fan @yukimurabo has also posted a couple of pictures from Dengeki Maoh. This one reveals that a pair of ¥2,000 tote bags themed on Masamune and Mitsunari will be available in October 2015. Preorders will begin in late August. 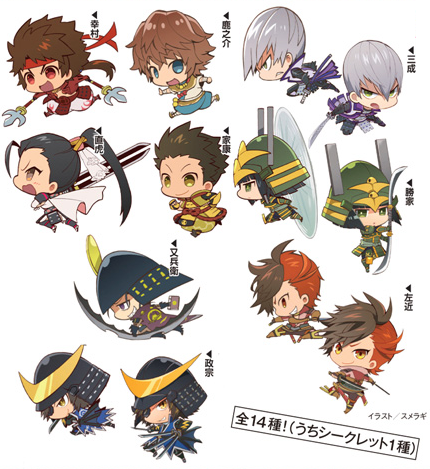 There will also be a Mame Sengoku Basara 4 Trading Rubber Strap collection released on 26th September 2015. There will be fourteen different designs plus one secret design. Each strap will cost ¥600 or a box will be available for ¥8,400. Preorders will open in late July. Last but not least, the fifth compiled Showgeki Basara Talk! Vol. 5: Sakon & Katsuie No Maki Special-ban CD has been announced for release on 26th September 2015. Sen No Rikyuu's seiyuu Sakurai Takahiro will appear as a guest and the BASARA CHALLENGE skits will be the family restaurant one previously announced, an episode about working as lifeguards at a pool and an exclusive bonus skit about a promise at an athletics meet. 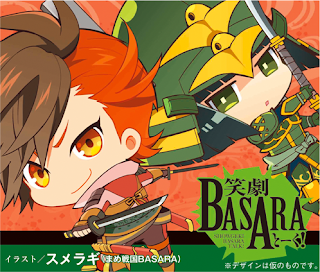 Talking of digital books, I've recently found a fair few Sengoku Basara artbooks, guides, manga and light novels on Bookwalker and am currently getting all of the Mini/Mame Basara volumes (they're so much fun!). The catch is that the Basara books are region locked for purchasing (not everything on Bookwalker is - Famitsu can be purchased internationally, for instance) but this can be gotten around with a VPN/proxy and the app itself isn't region locked so you can read Japan-only books on the international app just fine. It's worth checking out if you're not fussed about physical goods, especially as it works out cheaper because there's no shipping cost. More digital books would be great; for me the worst is always Dengeki Maoh and other thick manga 'bricks' as I have nowhere to store them and end up throwing them away after I read them, which feels wasteful when I might want to reread them later. I think the industry will get there eventually but I guess the bonus goodies for Sengoku Basara Magazine make it more of a premium product. They'd want to offer it at a discount as an eBook to compensate for the missing bonus items which would make it awkward to justify the cost of the full version. Anyway the moves, even if I'm not sure they have much practical application with the rest of Kenshin's moveset, look AMAZING and I can't wait to try them out. I guess perhaps they're meant to clear humongous crowds and/or bind tough enemies and bosses? I also like how they showed them off in the hottest part of the Takeda home stage rather than against Shingen and a buncha peons. As if to say "see? KENSHIN IS THAT COLD." My translation sounds a little stilted in English but I guess anyone watching this is already used to Kenshin's dashing manner of speaking so I let it go. I'm so glad they're weaving cool gameplay clips between all of the story videos - even if they're short.